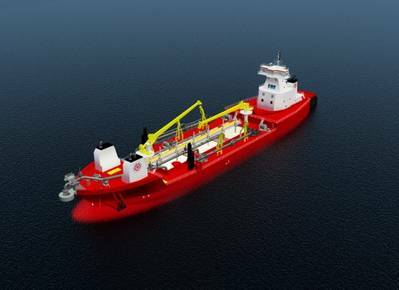 Great Lakes Dredge & Dock Corp. contracts Signal International for construction of hopper barge & tugboat. Great Lakes Dredge & Dock Corporation the largest provider of dredging services in the United States and a major provider of commercial and industrial demolition and remediation services, announce the execution of definitive contracts for the construction of a 15,000-cubic-yard-capacity trailing suction hopper barge and 14,000-horsepower tug. The Company has contracted with Signal International Inc., operating from Mobile, Alabama; Orange, Texas; and Pascagoula, Mississippi, for the construction of both vessels, with an option to build an additional dredge, should domestic or international market conditions warrant. The aggregate cost of the initial dredge is expected to be approximately US$ 94-million. The dredge will feature two 36-inch suction pipes and will be able to dredge at depths of up to 125 feet. Even with a maximum load it will only have a draft of 28 feet, the best carrying-capacity-to-draft ratio in the U.S. dredging industry. The new dredge will be well-suited to multi-use applications. It will be deployed for channel deepening, maintenance dredging, beach nourishment, and coastal restoration projects with long distance transport capabilities. Great Lakes has also contracted with BAE Systems in Mobile, Alabama to build two new high-capacity material dump scows that will be delivered in 2013 with an option to build two additional barges also with delivery in 2013. The scows will be used primarily on capital deepening and coastal restoration work on the East and Gulf coasts. These two new scows, with an aggregate cost of approximately $17 million, will each have a carrying capacity of 7,700 cubic yards of dredged material.